There’s nothing like a car ride to put a baby to sleep, right? That is unless you baby hates car rides and needs to be entertained. Our little one despised his car seat and car rides but one change helped make a difference: buying a new travel mirror. The Baby Einstein Music and Discovery Travel Mirror has other features to keep your baby occupied. There are four lights that flash alongside melodies. There’s four play modes too: melodies and lights, melodies only, lights only, and learning mode—which teaches your baby colours in three languages (English, French and Spanish). There’s an on/off button and helpful timer with presets for 10, 20, 30 or 60 minutes before it shuts off on its own. The travel mirror takes three AA batteries which are included. To install the mirror there’s an adjustable click strap to mount to headrests so you can see baby while driving. In our tests, it mounted on well but could benefit from elastic straps for a tighter and snugger fit. While this travel mirror won’t stop your baby from crying, it has helped in our case to make car rides less boring and a bit more existing. If you want to stop a crying baby, it’s worth trying anything. 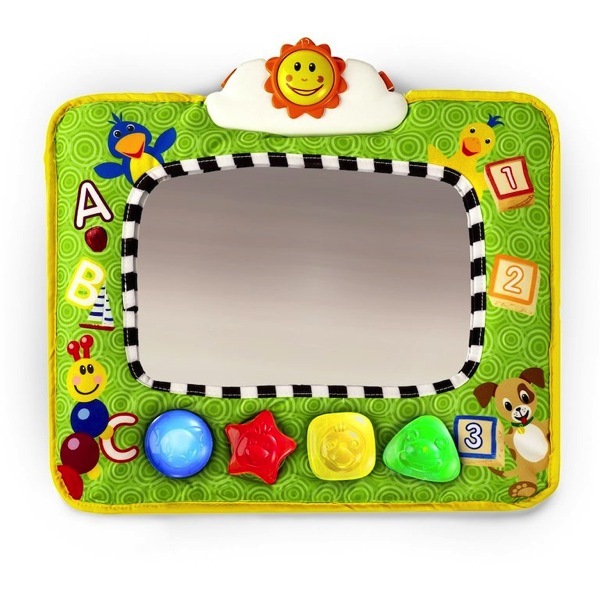 Can can find the Baby Einstein Music and Discovery Travel Mirror from Amazon.ca or Amazon.com.